Next, change a few of the properties of the new Drop-down List (DDL) field. 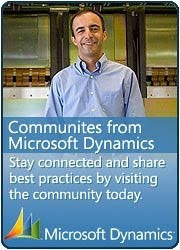 Click on the DDL and find the Properties window. It might be hidden behind another window. To activate it you could select Properties from the Layout Menu or enter CTRL+M. On the Object Tab double click the Data Type entry to open the Local Field Definition window. I like to change the name to something logical; in this example, "ddlInvoiceFormat". Then click the Static Value elipse to access the Static Text Values Window. Enter the values you want to appear in your drop down list and click Insert. You're done with Modifier for now. Click Ok to close the Static Text Values and Local Field Definition Windows. 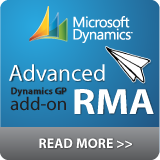 Then select Microsoft Dynamics GP from the File menu to return to GP. When prompted, save the changes made to the window layout. Once back in GP, grant security to the modified window. Now, you have a Drop-down List on your window with your static values. That's nice but only half the battle. Next, we need to add the VBA code to store the data. In this example, I chose to store the data in the User Defined 2 field on the Customer Maintenance window. You could have elected to store this in your own table (using ADO) or the DUOS. To do this, open the Customer Maintenance window and add the window to your VBA project (CTRL+F11 or Tools>>Customize>>Add Current Window to Visual Basic). Then, add the fields you need on the window to your VBA project (Shift+F11 or Tools>>Customize>>Add Fields to Visual Basic). In this example, add the Customer ID, User Defined 2, and the new Drop-down List (ddlInvoiceFormat). Finally, open the VBA Editor (Alt+F11 or Tools>>Customize>>Visual Basic Editor) to add the code. Declare a variable to track whether or not a user has changed the Drop-down List (DDL) value. On the CustomerID_Changed event set that variable to false. On the ddlInvoiceFormat_AfterUserChanged event set the UserDefined2 value equal to the Drop-down List value and the variable to True only if the CustomerID is empty. There's no point in setting the value otherwise. Only if a User did not change the ddlInvoiceFormat value (bolUserChanged = False) set the ddlInvoiceFormat equal to the UserDefined2 value. This is how the value in the Drop-down List gets updated as you scroll through or select different records in the window. Of course, you wouldn't want to update the DDL if the user just changed it. The reason for putting the new Drop-down List field on the window anywhere space was available was to allow for testing and validation before moving it to a permanent place. You'll notice that the value stored in the User Defined field is an integer value that corresponds to each static text value. You could translate that with VBA and store the static text value or translate it when necessary later in a query or report. Once the code is in place and tested, go back into Modifier (Tools>>Customize>>Modify Current Window) to move it to a permanent position and in this case make the User Defined 2 field invisible. Click on the User Defined 2 field and change the Visible Property to False. The new Drop-down List will replace that field on the window for the user. Finally, move the new Drop-down List on top of the User Defined 2 field then change the tab sequence and size/align the field accordingly. The end result is a User Defined field that is no longer a free form text but rather a Drop-down List. Great instructions! Worked like a charm. Can you also show me how to store the text values in the field as opposed to the integer? I personally never solved that problem. If you figure that our please share it with the community.